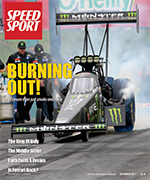 Beginning April, 2017, SPEED SPORT no longer offers a “Digital Edition” of SPEED SPORT Magazine. 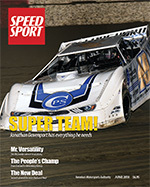 All magazine content is posted along with the other SPEEDSPORT.com content on this website. Select feature articles and editorial are reserved for subscribers only. Subscribers who have either the Digital Only or any Print Subscription have unlimited access to this content. If you are a print subscriber and have not yet created an online account, you’ll need to do so first before you can login to access the magazine/premium content on SPEEDSPORT.com. Click HERE to get started. To browse content from current and past issues of SPEED SPORT Magazine, click the appropriate link below. The April issue of SPEED SPORT Magazine salutes America’s short tracks. We highlight tracks from coast to coast, including interesting facts and figures, while profiling Lucas Oil Speedway, Bob Sargent’s Track Enterprises and we examine the recent explosion in popularity of dirt track racing. As well, we profile racing teacher Morgan Turpen and sprint car team owner Mike Heffner among others. Columnists include Ron Lemasters, Keith Waltz, Mike Kerchner, Bones Bourcier, Bruce Martin, Susan Wade, Adam Fenwick, Dave Argabright and Ralph Sheheen. Click HERE to read these articles online. 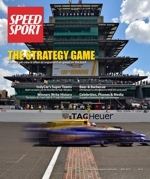 SPEED SPORT’s annual Indianapolis 500 issue features Alexander Rossi on the covering while investigating the importance of race strategists to the outcome of the world’s biggest race. We also look at the reign of the multi-car team in IndyCar racing and take a look back at two of A.J. Foyt’s biggest victories in 1967 and 1977. Ed Carpenter, Conor Daly and Juan Pablo Montoya are also profiled. We also look at the beer & barbecue persona of NASCAR veteran Clint Bowyer. Columnists include Ron Lemasters, Keith Waltz, Mike Kerchner, Bones Bourcier, Bruce Martin, Susan Wade, Adam Fenwick, Dave Argabright and Ralph Sheheen. Click HERE to read these articles online. 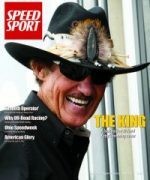 The undisputed King of stock car racing, Richard Petty, turns 80 on July 2. SPEED SPORT takes a look back at his amazing career and how he became “The King.” We also take our annual look at dirt late model racing with profiles on drivers including Bobby Pierce, Earl Pearson Jr. and Ray Cook. We also recap the 101st Indianapolis 500 and look ahead to the 35th running of Ohio Speedweek. Columnists include Ron Lemasters, Keith Waltz, Mike Kerchner, Bones Bourcier, Bruce Martin, Susan Wade, Adam Fenwick, Dave Argabright and Ralph Sheheen. Click HERE to read these articles online. The hottest driver in all of motorsports during the month of June, Kyle Larson is featured on the cover of the July issue of SPEED SPORT Magazine. Larson tells SPEED SPORT how his NASCAR career is hitting the marks and shares his passion for open-wheel racing. We also examine the state of the Camping World Truck Series and look at what Monster Energy has brought to the NASCAR Cup Series. 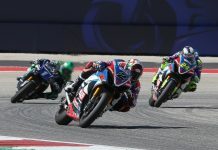 In addition, we profile motorcycle racers Jonathan Rea, Ken Roczen and Brandon Robinson, along with feature stories on Pocono Raceway, asphalt racing in Texas and USAC Silver Crown Series champion Chris Windom. Columnists include Ron Lemasters, Keith Waltz, Mike Kerchner, Bones Bourcier, Bruce Martin, Ron Hedger, Susan Wade, Adam Fenwick, Dave Argabright and Ralph Sheheen. Click HERE to read these articles online. 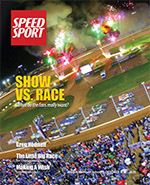 Featuring one of dirt-track racing’s most popular families on the cover, the August issue of SPEED SPORT Magazine focuses on sprint car racing in a salute to the annual Knoxville Nationals. Father-and-son racers Jac and Sheldon Haudenschild are on opposite ends of the spectrum with Jac winding down a Hall of Fame career and Sheldon one of the sport’s rising stars. We also profile Australia’s Madsen brothers and take a look at Jason Johnson’s thrilling Nationals win from a year ago. The Sprint Car Hall of Fame & Museum, team owner, sponsor and racing enthusiast Richard Marshall are also featured. SPEED SPORT remains in touch with other forms of the sport as well with stories regarding the anatomy of a NASCAR pit stop, McLaren’s Zak Brown, rising star Layne Riggs and the return to prominence of the USAC Silver Crown division. 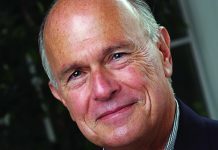 Columnists include Ron Lemasters, Keith Waltz, Mike Kerchner, Bones Bourcier, Bruce Martin, Susan Wade, Adam Fenwick, Dave Argabright and Ralph Sheheen. Click HERE to read these articles online. 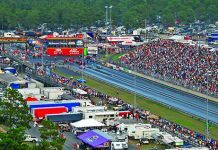 The Burnout may be one of the most fan-thrilling aspects in all of motorsports, thus, as part of its September salute to drag racing, SPEED SPORT takes an in-depth look at the art of the burnout. 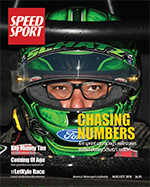 We also examine how Tony Schumacher has become The King of Indy with 10 U.S. Nationals victory and get up close with Top Fuel driver Brittany Force. The NHRA rookie class and veteran crew chief Rahn Tobler also get their time in the sun. Away from the drag strip, readers will learn how faith has kept the dream alive for sprint car racer Harli White and we profile NASCAR driver Darrell Wallace Jr. and up-and-coming open wheel racer Colton Herta. Columnists include Ron Lemasters, Keith Waltz, Mike Kerchner, Bones Bourcier, Bruce Martin, Susan Wade, Adam Fenwick, Dave Argabright and Ralph Sheheen. Click HERE to read these articles online. 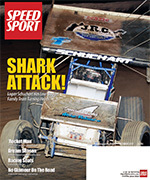 October is Shark month for SPEED SPORT Magazine with Shark Racing driver Logan Schuchart featured on the cover while we profile the success one of the lower budget teams on the World of Outlaws Sprint Car Series circuit. Also featured this month, we catch up with four-time Indianapolis 500 winner Rick Mears. We also take a look at the possible use of SAFER barriers in drag racing and explore the technology of containment seats for racers. Modified driver Timmy Solomito, late model racer Brandon Sheppard and the World Finals are also profiled. Columnists include Ron Lemasters, Keith Waltz, Mike Kerchner, Bones Bourcier, Bruce Martin, Susan Wade, Adam Fenwick, Dave Argabright and Ralph Sheheen. Click HERE to read these articles online. 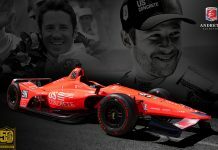 The Verizon IndyCar Series will introduce universal aero kits to the design of the Indy car next season and the new look of the car is featured on the November issue of SPEED SPORT Magazine. This issue includes a profile of these aero kits, as well as a question-and-answer session with IndyCar President of Competition Jay Frye. Also in this issue we feature USAC racer Tyler Courtney and Pennsylvania sprint car driver Lucas Wolfe. We also take a look at the future of Formula One and profile up-and-coming NASCAR racer William Byron. Columnists include Ron Lemasters, Ron Hedger, Keith Waltz, Mike Kerchner, Bones Bourcier, Bruce Martin, Susan Wade, Adam Fenwick, Dave Argabright and Ralph Sheheen. Click HERE to read these articles online. 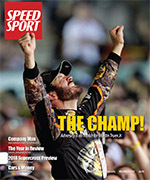 Featuring Monster Energy NASCAR Cup Series champion Martin Truex Jr. on the cover, the December issue of SPEED SPORT Magazine recaps the on and off-track action of an entire season of motorsports action. In addition to Truex’s unlikely run to the championship, we also look at the top-10 stories of the year and examine the other top events of the season, while taking a closer look at the champions of various touring series. SPEED SPORT also profiles Indy car driver turned road racer Helio Castroneves and midget driver Chad Boat. Columnists include Ron Lemasters, Keith Waltz, Mike Kerchner, Bones Bourcier, Bruce Martin, Susan Wade, Adam Fenwick, Dave Argabright and Ralph Sheheen. Click HERE to read these articles online. 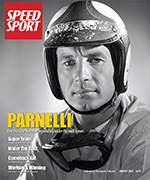 Known throughout the motorsports world simply as “Parnelli,” Parnelli Jones is featured on the cover of the January issue of SPEED SPORT Magazine and profiled in classic style by celebrated motorsports writer Bones Bourcier. 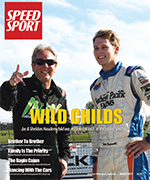 Also featured in this issue is the new Acura sports car team, midget champion Spencer Bayston, the growth explosion of indoor racing, Silver Crown ace Kody Swanson and Indy car racing’s Harding Racing operation. Columnists include Ron Lemasters, Ron Hedger, Keith Waltz, Mike Kerchner, Bones Bourcier, Bruce Martin, Susan Wade, Adam Fenwick, Dave Argabright and Ralph Sheheen. Click HERE to read these articles online. 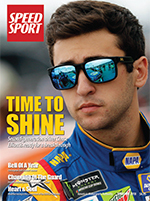 Second-generation NASCAR driver Chase Elliott is featured on the cover of the February issue of SPEED SPORT Magazine. We examine Elliott’s career to this point and whether or not this will be his breakout season. We also explore how NASCAR reloads its driving talent pool, and look at the changing face of Hendrick Motorsports and look back at Christopher Bell’s 2017 season. Longtime ARCA President Ron Drager gets his moment in the sun and we also look back at the 1988 Daytona 500 and the last NASCAR race on Daytona Beach. SPEED SPORT takes a look at the changing face of Daytona Bike Week and we explore gasoline vs. methanol as a short-track racing fuel. Columnists include Ron Lemasters, Ron Hedger, Keith Waltz, Mike Kerchner, Bones Bourcier, Bruce Martin, Susan Wade, Adam Fenwick, Dave Argabright and Ralph Sheheen. Click HERE to read these articles online. 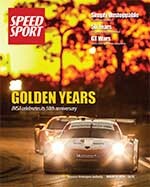 SPEED SPORT’s annual salute to road racing issue features the unique Mazda Prototype on the cover, while inside readers learn about the interesting relationship between the Japanese manufacturer and the German Joest team, which fields the Mazda Prototypes. We also preview year three for the Haas F1 Formula One team and explore Honda’s history in Formula One. 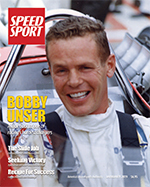 As well, SPEED SPORT introduces readers to the newest racing Unser — Loni Unser. We also profile sprint car racing crew chief Barry Jackson, open-wheel racer Bobby Santos, meet paralyzed racer George Hammel and drivers tell us what it’s like to wheel a Formula E car. Columnists include Ron Lemasters, Keith Waltz, Mike Kerchner, Bones Bourcier, Bruce Martin, Susan Wade, Adam Fenwick, Dave Argabright and Ralph Sheheen. Click HERE to read these articles online. 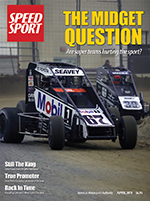 SPEED SPORT asks and answers the question … “Do super teams hurt midget racing?” in the April issue of the magazine. We also profile former racer and Auto Racing Promoter of the Year Steve Beitler, look back at the career of sprint car driver Rick Ferkel and revisit California’s West Capital Raceway. Thompson Motorsports Park in Connecticut, Ohio’s Mansfield Motor Speedway and Minnesota’s Jackson Motorplex are also highlighted. Columnists include Ron Lemasters, Keith Waltz, Mike Kerchner, Bones Bourcier, Bruce Martin, Susan Wade, Adam Fenwick, Dave Argabright and Ralph Sheheen. Click HERE to read these articles online. Sebastien Bourdais returns to Indianapolis Motor Speedway this month, less than a year after he suffered devastating injuries during a crash while attempting to qualify for last year’s Indianapolis 500. 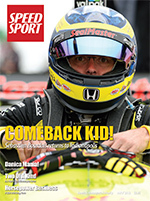 Bourdais, who is featured on the cover of the May issue of SPEED SPORT Magazine, discusses his return to The Greatest Spectacle in Racing. 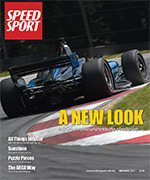 This issue also examines the new partnership between Tony Kanaan and A.J. Foyt, a look back at the 1968 Indianapolis 500 and an interview with Michael Andretti. Away from Indianapolis, we profile Jamie McMurray, Niece Motorsports and Kyle Hamilton, and we also pay tribute to the 70th running of the Little 500 at Anderson (Ind.) Speedway. Columnists include Ron Lemasters, Keith Waltz, Mike Kerchner, Bones Bourcier, Bruce Martin, Susan Wade, Mandee Pauch, Dan Knutson, Adam Fenwick, Dave Argabright and Ralph Sheheen. Click HERE to read these articles online. Jonathan Davenport has been the hottest late model driver in the country this year, but he’s not done it without a talented team that was assembled around him. Davenport and his familiar No. 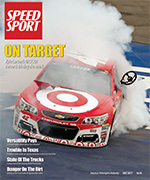 49 are featured on the cover of the June issue of SPEED SPORT Magazine. Veteran dirt late model racer Tim McCreadie and up-and-comer Hudson O’Neal are also featured in this issue. We also question ARCA President Ron Drager upon the sale of the sanctioning body to NASCAR and explore off-road racing at Wisconsin’s legendary Crandon Int’l Raceway. NASCAR Xfinity Series driver Tyler Reddick is also featured and many of today’s top short-track racers share their favorite Father’s Day memories. Columnists include Ron Lemasters, Keith Waltz, Mike Kerchner, Bones Bourcier, Bruce Martin, Susan Wade, Mandee Pauch, Dan Knutson, Adam Fenwick, Tim Frost, Dave Argabright and Ralph Sheheen. Click HERE to read these articles online. Jared Mees has dominated American Flat Track racing during the past two seasons, and Mees’ No. 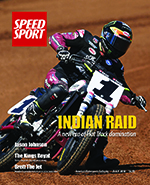 1 Indian bike grace the cover of the July issue of SPEED SPORT Magazine. Inside readers will learn how Indian has risen to the top of the sport so quickly. We’ll also explore increased manufacturer involvement in Flat Track racing. We also take an in-depth look at the past 35 years of the King’s Royal sprint car race at Ohio’s Eldora Speedway and we catch up with modified racing legend Brett Hearn as he prepares to turn 60. Indy car racer Robert Wickens and late model driver Josh Berry are also featured. Columnists include Ron Lemasters, Keith Waltz, Mike Kerchner, Bones Bourcier, Bruce Martin, Susan Wade, Mandee Pauch, Dan Knutson, Adam Fenwick, Tim Frost, Dave Argabright and Ralph Sheheen. Click HERE to read these articles online. 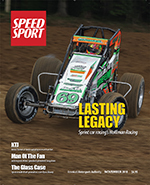 Traditionally dedicated to the Knoxville Nationals, sprint car racing’s biggest event, the August issue of SPEED SPORT Magazine features 10-time Knoxville Nationals winner Donny Schatz on the cover. We examine Schatz’s place in sprint car racing history and the milestones that lie ahead of him. We also look back at Kyle Larson’s participation in last year’s Nationals and profile sprint car racers Daryn Pittman, Tim Shaffer, James McFadden and Austin McCarl. 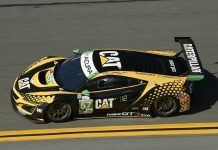 Veteran scribe John Jeppeson takes a look at the competitiveness of IMSA’s GTLM class and we profile ARCA Racing Series point leader Sheldon Creed. Columnists include Ron Lemasters, Keith Waltz, Mike Kerchner, Bones Bourcier, Bruce Martin, Susan Wade, Todd Heintelman, Mandee Pauch, Dan Knutson, Adam Fenwick, Tim Frost, Dave Argabright and Ralph Sheheen. Click HERE to read these articles online. Arguably the greatest drag racer of all time, 16-time NHRA Funny Car champion John Force graces the cover of SPEED SPORT’s September salute to drag racing issue. Readers find out what still fuels Force’s passion for the sport after so many years. J.R. Todd, Tanner Gray and Top Fuel drivers Terry McMillen and Scott Palmer are also profiled. We also examine the new tradition being built with Super DIRT Week at Oswego (N.Y.) Speedway, take a look back at the career of open-wheel racing legend Jack Hewitt, preview racing at Charlotte Motor Speedway’s ROVAL and recap Brad Sweet’s dominant Knoxville Nationals triumph. Columnists include Ron Lemasters, Keith Waltz, Mike Kerchner, Bones Bourcier, Bruce Martin, Susan Wade, Todd Heintelman, Mandee Pauch, Dan Knutson, Adam Fenwick, Tim Frost, Dave Argabright and Ralph Sheheen. Click HERE to read these articles online. Why do fans really go to the track? Do they want to see a race or a show? SPEED SPORT explores that question with the cover story of the October issue of the country’s oldest motorsports publication. We also look back at the life and death of sprint car driver Greg Hodnett and profile drivers Max McLaughlin, Paul McMahan, Rick Eckert and Lance Stroll. The fall is well known for big races and we take a closer look at California’s Trophy Cup and the Petit Le Mans endurance race. Columnists include Ron Lemasters, Keith Waltz, Mike Kerchner, Bones Bourcier, Bruce Martin, Susan Wade, Todd Heintelman, Ron Hedger, Mandee Pauch, Dan Knutson, Adam Fenwick, Tim Frost, Dave Argabright and Ralph Sheheen. Click HERE to read these articles online. Kevin Thomas Jr., one of the winningest open-wheel racers of 2018, gave Hoffman Racing its 100th USAC sprint car victory this season. Thomas and the famed No. 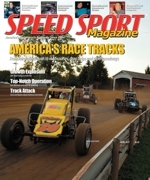 69 sprint car appear on the November cover of SPEED SPORT Magazine. Pat Sullivan profiles Thomas and the historic family-run team. We also get to know Indianapolis Motor Speedway President Doug Boles, who has proven to be a man of the fans. NASCAR driver Ryan Blaney, legendary promoter “Humpy” Wheeler and the Toyota driver development program are also profiled. Columnists include Ron Lemasters, Keith Waltz, Mike Kerchner, Bones Bourcier, Bruce Martin, Susan Wade, Mandee Pauch, Dan Knutson, Adam Fenwick, Tim Frost, Dave Argabright and Ralph Sheheen. Click HERE to read these articles online. 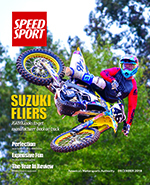 Suzuki’s Supercross operation is featured on the cover of the December issue of SPEED SPORT Magazine as we look ahead to the new season for the Monster Energy Supercross series. As well, we recap the top 10 stories of the 2018 racing season … from triumph to tragedy and more. We also take a look back at the champions and other drivers who enjoyed great success in 2008. Columnists include Ron Lemasters, Keith Waltz, Mike Kerchner, Bones Bourcier, Bruce Martin, Susan Wade, Mandee Pauch, Dan Knutson, Adam Fenwick, Tim Frost, Dave Argabright and Ralph Sheheen. Click HERE to read these articles online. 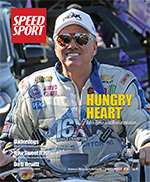 As has become tradition for the first issue of the New Year, SPEED SPORT Magazine features a racing legend on its cover. This time it’s three-time Indianapolis 500 winner and Pikes Peak Hill Climb king Bobby Unser. Inside longtime SPEED SPORT contributor Bruce Martin profiles the champion driver. Also featured in this issue are features on the Chili Bowl and on racers Carson Macedo, Hailie Deegan, Lewis Hamilton, Shawn Becker and CORE Motorsports. We also examine changes to sprint car racing safety. Columnists include Ron Lemasters, Keith Waltz, Mike Kerchner, Bones Bourcier, Bruce Martin, Susan Wade, Mandee Pauch, Dan Knutson, Adam Fenwick, Tim Frost, Dave Argabright and Ralph Sheheen. Click HERE to read these articles online. 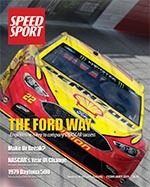 Monster Energy NASCAR Cup Series champion Joey Logano and Ford Performance are featured on the cover of the February issue of SPEED SPORT Magazine as we explore how Ford and its teams work together to win races. As a lead in to Florida Speedweeks, we also feature Cup Series driver Kyle Larson, NASCAR President Steve Phelps, rookies Daniel Hemric and Ryan Preece and the most successful crew chiefs in NASCAR history. We also explore the changing landscape of NHRA Pro Stock racing and look back at the Chili Bowl. Columnists include Ron Lemasters, Keith Waltz, Mike Kerchner, Bones Bourcier, Bruce Martin, Susan Wade, Mandee Pauch, Dan Knutson, Adam Fenwick, Tim Frost, Dave Argabright and Ralph Sheheen. Click HERE to read these articles online. 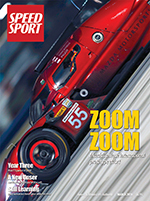 Sports car racing takes center stage with the March issue of SPEED SPORT Magazine. We celebrate IMSA’s 50th anniversary, examine the evolution of historic Sebring Int’l Raceway and look at the manufacturer war in the WeatherTech Championship’s GT Le Mans class. Spanning the motorsports’ world, we also profile late model driver Brandon Overton, sprint car team owner Bernie Stuebgen and formula car champion Kyle Kirkwood. Finally, we look ahead to IndyCar’s first visit to the Circuit of The Americas and remember the 50 years of NHRA’s Gatornationals. Columnists include Ron Lemasters, Keith Waltz, Mike Kerchner, Bones Bourcier, Bruce Martin, Susan Wade, Mandee Pauch, Dan Knutson, Adam Fenwick, Tim Frost, Dave Argabright and Ralph Sheheen. Click HERE to read these articles online. 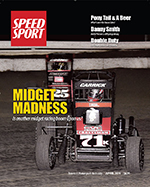 One of the oldest forms of short-track racing, midget racing is featured on the cover of the April issue of SPEED SPORT Magazine and we explore the signs that this popular form of small-car racing is making a comeback. Veteran sprint car drivers Jason Sides and Danny Smith are featured and we profile racing promoters Steve Earwood, John McKarns and Chris Tilley. Columnists include Ron Lemasters, Keith Waltz, Mike Kerchner, Bones Bourcier, Bruce Martin, Susan Wade, Mandee Pauch, Dan Knutson, Adam Fenwick, Tim Frost, Dave Argabright and Ralph Sheheen. Click HERE to read these articles online. Note: Content from issues prior to April, 2017 is temporarily unavailable online.